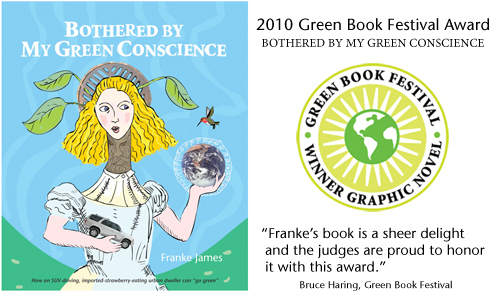 Author and artist, Franke James commented, “I’m thrilled it won the Green Book Festival Award for Graphic Novels! Book awards catch the attention of the media — and are therefore a great way to get the core message of my book to the public, and that is, ‘Do the hardest thing first.’ And then brag about it, shamelessly! Tell everyone about the wonderful green thing you did! Pretty soon, you’ll discover it’s fun and you’ll be inspiring others. Your friends and family may feel envious at first — but before you know it, they’ll be doing their own ‘hard green thing.’ And then we’ll have a real green revolution happening! And we need that. Bothered by My Green Conscience is the story of my true-life adventures in going green. It includes the story of us selling our only car (an SUV), winning approval from Toronto City Hall for the right to build a green driveway (and actually building it as a long weekend DIY project), rediscovering eccentric glamour in my own closet, understanding the real poop on social change, and also writing a visual letter to my future Grandkids in 2020, and wondering how they will judge us. 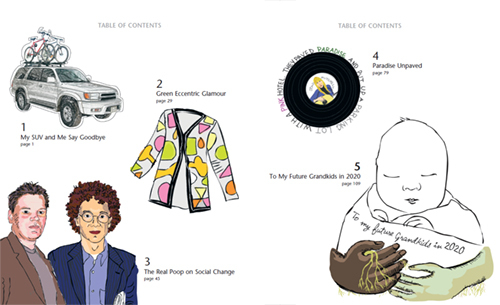 The collection of five visual essays was published as a 160-page full color book by New Society Publishers in April 2009. Read about Franke’s Green Conscience Art Workshops to see what is bothering other people’s green consciences. 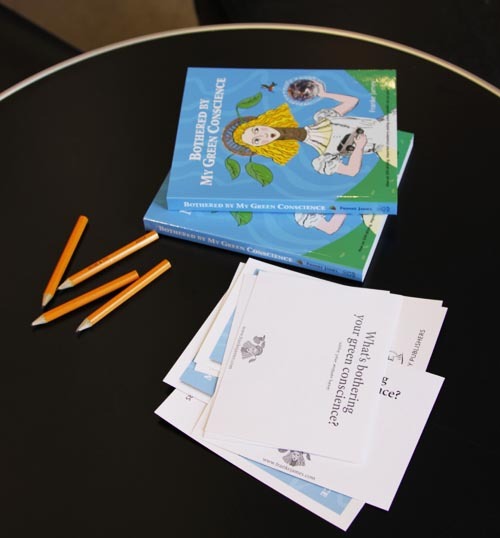 Since the book was published in 2009, Franke has spoken at educational events in Canada and the United States, including the University of Colorado, the Canadian Ecology Centre, Bates College, Ontario Teachers Federation, and the University of Cincinnati. You’ve changed all your light bulbs and switched to cloth bags at the grocery store. You recycle cans and bottles and you don’t print out that e-mail unless you absolutely have to. What’s next? Using her signature style of lively drawings mixed with photos and hand drawn text, artist Franke James shows how we can meet the global warming challenge with imagination and creativity. Five vibrant, dynamic, full-color visual essays present refreshing and insightful ideas that make climate change personal. Bothered by My Green Conscience is a must-read for anyone who is concerned about climate change and ready to take the next step towards a more sustainable lifestyle. Fun, engaging, humorous and upbeat, this book is an ideal gift for anyone in your life who is seeking inspiration to create change. TRACKBACK […] One of the artists I mentioned on Monday is Franke James, who’s work I discovered sometime last year. Franke is extremely active as an artist and activist speaking on the environment and our responsibilities as citizens of the earth. Franke James merges science, art and storytelling to inspire people to take action and “do the hardest thing first” for the planet. I have Franke’s books, follow her blog, and follow her on twitter. I truly admire the way she really gets the “word” out while seeming to have fun and do something she loves. This is what I want to do! So today when I saw Franke was on twitter I did something I’ve never done, I direct messaged her and said something about loving what she’s doing and, admiring, and hey maybe you could look at my project and tell me what you think. Guess what, she tweeted me right back made a pledge and gave me a shout out! I love her. That gave me a whole new perspective on how to go about both promoting Journey to Confluence and defining my new work while my new business.